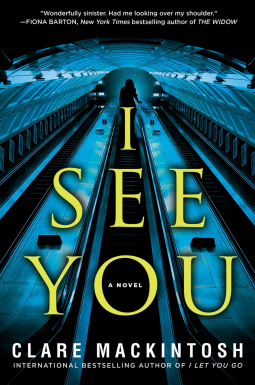 Clare Mackintosh offers a captivating story that you will surely lose sleep over. International bestselling author, indeed! Words cannot express how fulfilling this story is. I See You has everything you would expect from a mystery, but more daring. The story is written from three perspectives. Zoe Walker, who becomes paranoid when she finds her picture in a newspaper ad; DC Kelly Swift, who is determined to catch all the bad guys; and of course, the killer. I believe this is the first mystery I've read that mixes first person and third person perspectives in this manner. It was strange at first, but I liked believing that every chapter had its own mini cliff hanger. It made me read that much faster so that I could get back to whatever situation was just happening. If findtheone.com was a real website I'd be just as freaked out as Zoe Walker. As much as I don't want to believe that someone could aid in the stalking of women, I could picture it happening in real life. All of Zoe's paranoia throughout the story took a life of its own. I felt just as anxious as she did and I knew to expect something terrible. The steady pacing of the novel did absolutely nothing to calm my nerves, but I love that Clare Mackintosh keeps readers in the moment. She avoids jerking you around or stringing you along. Every moment of the story is crucial and leads to a place so unlike usual mystery conclusions. I could not contain myself by the end of the novel. Clare Mackintosh steps away from a cookie-cutter ending and gives readers something to think about. I spent the next few hours after reading wondering about scenes in the story that were not focused on, but added to the story's conclusion. The ending was a genuine surprise, but going back through the book I can see how the story leads to the jaw dropping end.